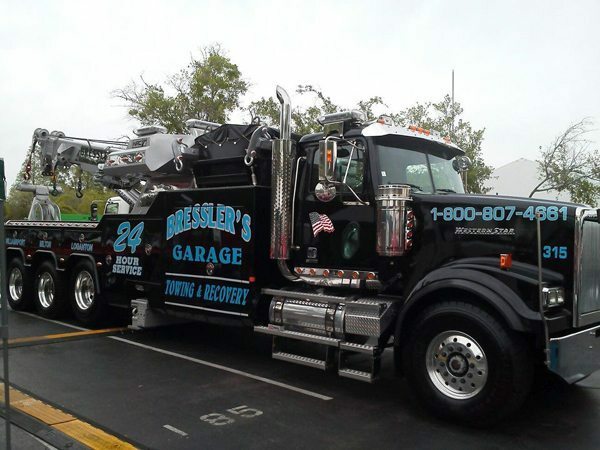 In a world of flash and pizzazz, sometimes what stands out are the good old-fashioned basics, such as those found on the simple and straightforward graphics of Bressler’s Garage’s heavy-duty trucks. Based in three locations in central Pennsylvania, the company was formed in 1970 and has evolved into one of the state’s largest fleets specializing in heavy-duty towing and recovery. The presence of two of their identical Western Star 4900/NRC 50/65 sliding rotators grabs attention. These black-and-silver units include five winches, an NRC rigging box for extra storage and a telescoping light tower that lights up the work area at night. Color coordination adds to the truck’s presence, as is the case of their unit’s black background and all-silver slider. The large, reflective lettering on the truck appears in light blue with a white shadowing and pops out against the black background. It highlights the company name, written in an arc-shaped form, with the rest of the company name appearing underneath in contrasting styles. The blue lettering of “24” with the white lettering of ‘hour service’ just underneath appears, sending an important message.